In 1810, The Netherlands were annexed by the French empire of Napoleon. This did not last long (the French empire collapsed after the failed Russian expedition of 1813), but it did have lasting consequences. French law was introduced in 1810-1811, and generally remained in place after 1813. For genealogists, 1811 is the turning point because of the introduction of the civil register. The most important change from a genealogist's point of view is the introduction of the civil register on 1 January 1811. Since that day, all births, deaths and marriages have to be registered by the local government. 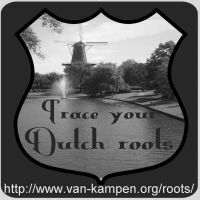 The civil register is the main source for Dutch genealogy research in the 19th and early 20th century (for privacy reasons, most 20th and 21st century records are not accessible). In 1810-1811, church registers were confiscated by the government, to be used in place of the civil register for the years before 1811. These church registers are still government property and readily available in Dutch archives (and on microfilm in many family history centers). They are the main sources for 17th and 18th century research. Post-1811 church registers are usually still church property and often hard to find and access. Surnames became required and fixed. Surnames were in use long before 1811, but there was often no fixed spelling, and no requirement to use the father's surname. In the rural areas of the north and east, people often had no fixed surname at all, but used patronyms, nicknames, or the name of the farm they lived and worked on. Since 1811, everyone gets the father's surname (or mother's if she's unmarried), and surnames can only be changed by royal decree or court order. Conscription was introduced in 1810 and existed until 1996. These changes are just the tip of the iceberg. Feel free to discuss these and other 1810/1811 changes in the comments below.